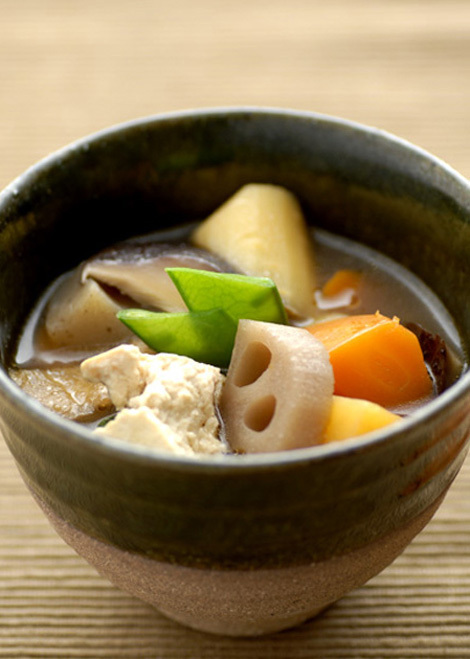 Buddhist Cuisine is little known outside of Asia, but is a traditional way of cooking that goes back hundreds of years and is still eaten by monks in Japan today. As Buddhists believe killing and eating animals or fish is wrong, the food is completely vegan. With the ascension of vegetarianism and veganism in the West, interest in Buddhist cuisine has also risen. Those following a macrobiotic diet could also learn a great deal from this style of cuisine which primarily consists of fresh seasonal vegetables and soy bean based ingredients. Like Japanese food but can’t speak Japanese? Then this word glossary is for you! 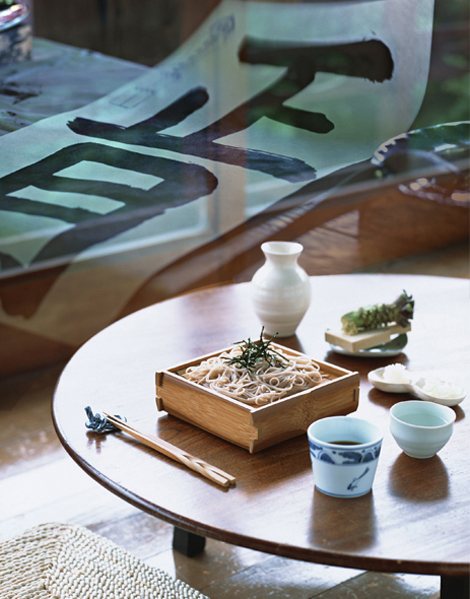 It contains the most important words that you may find in menus or cookery books, as well as some words that you will find helpful if you go to Japan or dine out with Japanese friends. Bento – 弁当 – This refers to any kind of box that has a ‘mixed’ lunch or meal inside. It can be used to mean both a bento that you make yourself (packed lunch) or that is served in restaurants or takeaways. Usually contains rice, fish or meat, pickles, with optional extras such as egg or salad. Bakery: Buy One Get One Offer This Weekend Only! 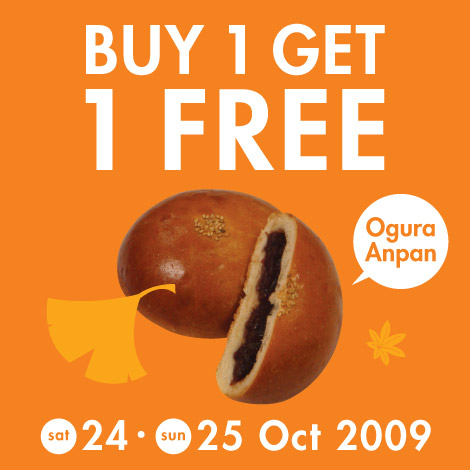 This weekend 24th and 25th October our new instore bakery is offering buy one get one free on Ogura Anpan. Ogura Anpan is a tasty bread filled with Adzuki sweet bean paste and topped with a sprinkling of white sesame seeds. Compared to similar Western cakes, Ogura Anpan is lower in fat, high in fibre and vitamin B. Come to the Bakery section of the new Japan Centre Food Hall, 14-16 Lower Regent Street, SW1Y 4PH. Limited offer while stocks last. 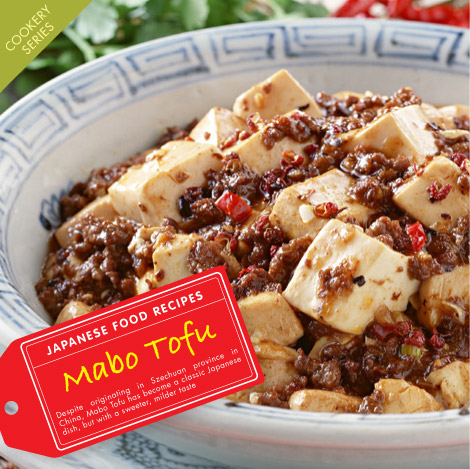 Despite originating in Szechuan province in China, Mabo Tofu has become a classic Japanese dish, but with a sweeter, milder taste. It can be made very quickly and easily which has made it a popular dish in Japan for any occasssion. You can buy some of the required ingredients directly at Japan Centre, just click on the link and add it to your basket. Feel free to leave any comments or tips at the bottom. 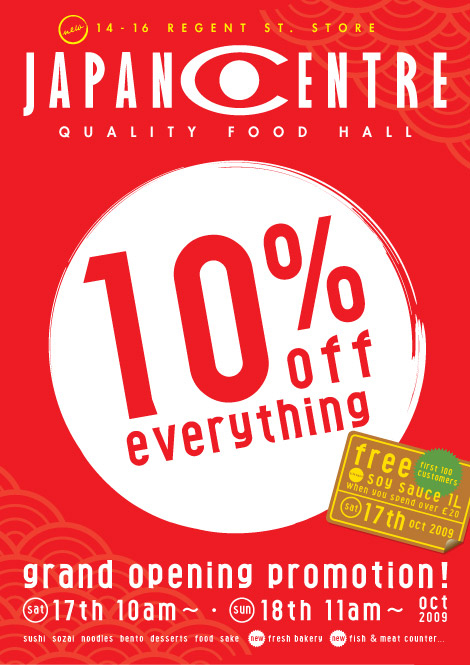 In celebration of the opening of our brand new Japan Centre Food Hall on Regent Street, we are having an amazing 10% off everything sale! On top of that, for the first 100 customers to spend over £20 you can get a free 1 litre bottle of Soy Sauce! The new Japan Centre on Regent Street is now open, and with 10% off everything, there really is no excuse not to come this weekend! Please note this special discount is only available at the new Regent Street shop and not at 212 Piccadilly Bookshop and Homeware premises.